The presidential candidate’s campaign got off to a bad start when social media castigated his logo. The race to the White House continues to gather speed, with Republican hopeful Donald Trump announcing that US Governor Mike Pence will serve as his running mate. 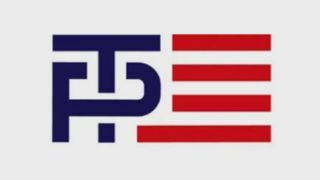 It’s not our place to comment on the politics of the election, however the logo design for the Trump-Pence candidacy has certainly caused a stir online. Can you tell why? Some people might see it straight away, while others might think it’s a lot of fuss over nothing. Revealed on 15 July, the Republican hopeful’s logo is a suitably brash and patriotic design, which tweaks the image of the American flag to include an interlocking monogram of the candidate’s surnames, T and P, in place of the usual block of 50 stars. The problem? Well, a lot have people have noticed that it looks a bit, let's say, suggestive. This might be a case of people wanting to ridicule the politician at every opportunity they get, but once you see the subtext they’re getting at, it’s hard not to notice it. With the T slotting through the loop in the P monogram, it’s doesn't take a huge amount of imagination to make some sort of vulgar connection. Aside from the smutty connotations, the logo has failed to impress designers online and it’s easy to see why. Using the image of the American flag isn’t exactly the most imaginative symbol a candidate could use, plus the composition of the monogram doesn’t even sit comfortably alongside the red and white stripes. It’s impossible to tell how much difference, if any, these logos will make in the run up to the election, but either way we’re sure to see a lot more of them before a new President is appointed in November.